At one point in The Wind That Shakes the Barley, an Irish audience is depicted watching a film about the War of Independence that gives rise to uproar in the cinema. The film is a newsreel outlining the details of the Treaty that had just been negotiated between the Sinn Féin delegation led by Michael Collins and Arthur Griffith, and the British cabinet fronted by Lloyd George and Winston Churchill. Responding initially with cheers, the mood of the audience divides and darkens as the realities of the historic compromise are spelled out on the screen. In this we have, perhaps, a dress rehearsal for Ken Loach's work since the 1960s, which has managed not just to entertain but to agitate audiences and bring viewers, in more ways than one, to their feet. A common response to representations of history on the screen is to claim that they end up simplifying events, reducing the complex texture of historical explanations to matters of heroes and villains. Yet the irony is that when history comes down to the small print - the nuances of motivation and context that tilt the course of events in one direction or another - a recourse to narrative is unavoidable. Even more to the point, cinematic images, precisely because of their capacity to capture throwaway details and offhand gestures, provide scope for the kind of incidental effects and seeming asides that fill in the picture of everyday life. To be sure, long-term social and economic trends are vital in any comprehensive account and, as we shall see, are essential to Loach's film. Questions of character and circumstance are no less crucial, however, as are the often tragic dilemmas that confront individuals and whose outcomes are unpredictable, even among friends. 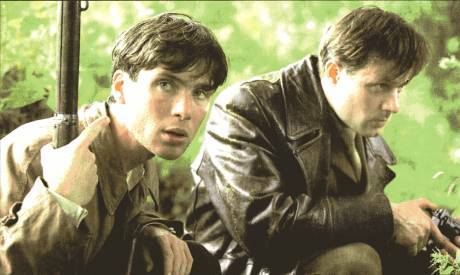 The Civil War posed just such a calamitous parting of ways for the protagonists of the film - Damien O'Donovan (Cillian Murphy) and Teddy O'Donovan (Padraic Delaney) - brothers who take up arms against each other in the ensuing conflict. One of the great strengths in Ken Loach's work has been his ability to raise questions over the "human interest" angle, the apolitical sphere of "the personal" or "the love story" that has provided an alibi for so many Hollywood happy endings. In Loach's last film, Ae Fond Kiss (2005), it is precisely an affair of the heart - the furtive intimacy of the bedroom shared by the Irish Catholic Róisín (Eva Birthistle) and the Scottish Muslim, Casim (Atta Yaqub) - that is the site of conflict, as different religious and cultural codes clash on their understandings of marriage and romance. Love, in a sense, gets the last word, but it is a love that divides and forces choices. There is no reassurance that love conquers all or that the emotionally scarred couple will live happily ever after. In The Wind That Shakes the Barley, family takes centre stage as the source of the most enduring loyalties and bonds between characters. Pleading with a roomful of volunteers to avoid an impending split after the Treaty, the Flying Column leader Finbar (Damien Kearney) reminds his comrades that the ties linking them are not merely ideological but personal, the connective tissue of intimate, local affiliations: "We may have our differences, but by Jaysus - after all we've been through together - we are all still one family - and that's how it's going to stay!" What Finbar does not appear to realise is that the family was already a political unit in Irish society, carrying within it the strains and fissures of the wider public sphere. Political allegiances ran deep, passed on from generation to generation, and as the famous Christmas dinner scene in James Joyce's Portrait of the Artist as a Young Man (1916) showed, even the most time-honoured family occasions of harmony and peace could be sundered with bitter political animosities. In The Wind That Shakes the Barley, the relationship across three generations between the grandmother Peggy (Mary O'Riordan), the mother Bernadette (Mary Murphy), and both daughter and son, Sinéad (Orla Fitzgerald) and Micheál (Lawrence Barry), testifies to these ancestral loyalties. Peggy belongs to a generation that barely survived the Famine and lived through the upheavals of the Land War in the late 19th century, but the film also breaks new ground in highlighting the active role of women in the struggle - as Republican court judges, as protesters in church, as members of Cumann na mBan. Popular mobilisation and networks of support in the countryside depended on "safe-houses" such as Peggy's that could be relied on to protect insurgents on the run from Crown forces or agents of the State. Moreover, it was not only a matter of what passed down through families - it was also what was done to such families, as the savage murder of the son Micheál by the Black and Tans at the start of the film graphically demonstrates. WHEN THE UNITY and solidarity of the War of Independence gave way to the Civil War in 1922, violence plumbed to unconscionable depths: the son of a government minister, Eoin MacNeill, was shot by Free State forces on Benbulben mountain in Co Sligo; Rory O'Connor, best man at the wedding of minister for justice Kevin O'Higgins was ordered to be shot by O'Higgins himself as a reprisal for the shooting of Free State politicians. Brother did indeed take up arms against brother, but the film is also determined to show that material issues bore on the choices made by the combatants. That family inheritance is not an uncritical, passive affair is made clear when Damien and Teddy meet for their last, fatal confrontation. Damien's troubled memory of their father's ruthless dismissal of one of the labourers on the family farm reactivates his commitment to a social revolution from the bottom up, reminding him in the process that not everything passed from father to son is worth retaining. As the murderous intensity of the Civil War revealed, divisions within communities did not owe their existence solely to informers but were driven by class and related conflicts, masked over by the seamless unity of popular nationalism. In an early scene, a local shopkeeper - or "gombeen" man - is brought before a Republican court for charging extortionate interest rates, but Teddy defends him, arguing that a financially solvent independent Ireland is impossible without business interests on its side. In the furious debates that take place later on the acceptance of the Treaty, the socialist Dan (Liam Cunningham), a former member of James Connolly's Citizen Army, is quick to point out that the Arthur Griffith who signed the Treaty was also the backer of William Martin Murphy's Lockout of unionised Dublin workers in 1913. Teddy sides with the Free State forces, advocating the kind of one-to-one reprisals sanctioned by Kevin O'Higgins; for his "sins", the socialist Dan is denounced from the pulpit for spouting "communistic poison" and "sewing hatred between neighbours". The Wind That Shakes the Barley helps to dispel any lingering traces of the kind of Boys' Own - or Ireland's Own - versions of the War of Independence that basked in the glow of imperial or national nostalgia. By way of contrast with modern "dirty wars", romantic and indeed official versions of the Anglo-Irish conflict liked to portray it as war by the rule book, pitting idealists and visionaries against (at best) officers and gentlemen, or (at worst) the refuse of English jails in the form of the Black and Tans. "Practically all commanders and intelligence officers considered that 90 per cent of the people were Sinn Féiners or sympathisers with Sinn Féin, and that all Sinn Féiners were murderers or sympathisers with murder. Judged by English standards, the Irish are a difficult and unsatisfactory people. Their civilisation is different and in many ways lower than that of the English. They are entirely lacking in the Englishman's respect for truth . . . [ and] many were of a degenerate type and their methods of waging war were in the most case barbarous, influenced by hatred and devoid of courage." AS THE CONTROVERSY over Neil Jordan's Michael Collins (1996) showed, one of the difficulties in making films about the War of Independence is bringing the story to an end, let alone a happy ending. Narrative closure fails to bring moral or political resolution, as feelings of injustice, outrage or even sorrow are not purged by the denouement of the plot. This has also been a feature of Ken Loach's approach to narrative from the outset, whether in his path-breaking television dramas, Cathy Come Home (1966) and Up the Junction (1965), his banned documentaries on police brutality during the miners' strike in Britain in 1984, or his controversial film on counter-insurgency in Northern Ireland, Hidden Agenda (1991). There is no attempt to rewrite the historical record or deny the realities of power in these films, but if the forces of the establishment invariably win the day, viewers are left in no doubt that it is because they have might, not right, on their side. Towards the end of Paul Laverty's screenplay, Free State forces raid Peggy's farm, the very "safe-house" that provided refuge to some of the same activists in the opening scenes. As the soldiers search and destroy, they empty barrels and sacks of grain, scattering the contents all around. As they leave, Sinéad refills a sack with the scattered seed, storing it for some future day in which the wind will shake the barley. Madam, - In his article on Ken Loach's The Wind that Shakes the Barley (June 17th), Luke Gibbons correctly asserts that there is no evidence of "ethnic cleansing" of Protestants in West Cork during the War of Independence. He is also correct to draw attention to the fact that racism was a prevalent British attitude. The British army regarded the entire population as their enemy. Viscount Montgomery of Alamein, then Brigade Major Bernard Montgomery, typically remarked: "It never bothered me a bit how many houses we burned. . . I regarded all civilians as 'shinners', and I never had any dealings with them." Such sentiments were also to be found in the minds and actions of those who set up and ran variants of the shadowy "Anti-Sinn Féin Society". Such "loyalists" gathered intelligence and went on RIC and Auxiliary raids to "spot", assassinate or torture their quarry. They were not representative of the whole Protestant community, many of whom were sympathetic to the republican cause. Protestants generally held little regard for the Black and Tans who, without distinction of creed, burned both Protestant and Catholic-owned property. British forces openly encouraged the loyalists and this has led some to conclude mistakenly that they were British forces in mufti. The revisionist historian Peter Hart holds this view. He spoke on it in a recent Rebel County documentary on the Ken Loach film on RTÉ 1. Hart concluded that Protestants shot for informing were innocent of such activities. Hart's view is a favourite among Orange Order members, as Drew Nelson, grand secretary of the Grand Orange Lodge of Ireland, explained to Gerry Moriarty (June 17th). Nelson believes, on the basis of Hart's research, in a "massacre of Protestants that took place. . . on the main street of Dunmanway, in April 1922". There is no evidence that Protestants were shot because of their religion. There is evidence that informers, whose names were left behind by departing Auxiliaries, were shot from April 26th to 28th, 1922 near Bandon, contrary to express IRA orders. The shootings were condemned by all shades of then pre-Civil War republican opinion. Two historians in particular, Brian Murphy and Meda Ryan, should have been interviewed. Murphy researched the topic in his recent work on The Origins and Organisation of British Propaganda and Meda Ryan dealt with it in her recent Tom Barry biography. Murphy first drew attention to the racist British attitudes cited in Luke Gibbons's piece. Possibly the documentary makers were also not aware that Irish Academic Press will soon publish John Borgonovo's Spies, Informers and the Anti-Sinn Féin Society. It undermines the contention that the IRA was sectarian in countering the activities of loyalist spies. Madam, - Luke Gibbons in his piece on Ken Loach's The Wind That Shook The Barley, states that the only Protestants killed by republicans in Cork during the War of Independence and Civil War were spies and informers. What are we to make, then, of this passage from Peter Hart's The IRA and Its Enemies? (Hart is most likely one of the "revisionists" referred to by Mr Gibbons.) He describes a killing rampage carried out by the Cork anti-Treaty IRA over two nights in April 1922. At the end of the bloodbath "ten men had been shot dead. All were Protestants. Hundreds [of their fellow Protestants] subsequently went into hiding or fled their homes in a wave of panic". Denis Lourdan, a local IRA guerrilla member, put it candidly: "our fellas took it out on the Protestants". Note: the reference to 'Our fellas took it out on the Protestants' in AG Mathews' letter (above) is the product of yet another Peter Hart misrepresentation. Dennis Lordan (not 'Lourdan') was talking in a light-hearted manner about a completely unrelated incident later during the Civil War to his friend, Dorothy Stopford, who was…... a Protestant. see Meda Ryan, Tom Barry IRA Freedom Fighter, 2003, page 165. The impression that Peter Hart gives is that Roman Catholics and Protestants had little or no social interaction and had more or less separate community lives. While in socio-economic terms Protestants in general had a higher economic status and while they were, in the main, unionists, community relations were quite normal. Their unionism was not generally of the fanatically sectarian Ulster unionist variety, though the minority of ‘Anti Sinn Fein society’ types certainly did attempt to impose the type of ‘ulsterisation’ in Munster that they imposed on nationalists in the north of Ireland. Unlike in the Six Counties, they failed in Munster. I have been reading recently a memoir by a Protestant solicitor in Skibbereen, who relates his participation in, and winning, the first case in the first Sinn Fein Court in the town. He later relates his participation in further Sinn Fein Courts, the threats to arrest him by the RIC, and the security measures he happily participated in to thwart the British authorities. He later relates the panic in Protestant circles over the April killings, since it was not known initially what the motive was. It was natural to assume that it was an attack on Protestants per se. Since the attacks ended as quickly as they had begun, stamped out firmly by the IRA in the form of Tom Barry, Liam Deasy and Tom Hales, the mainly Protestant males who left in a hurry came back. The Protestant solicitor, after venturing forth to Dublin and then to South Africa, left there in 1924 and returned to Skibbereen via New Zealand and Australia in 1926. He worked as a solicitor, and was prominent in community affairs. He ventured abroad often, married in his 60s and lived a happy and fulfilled life in the community in Cork. Like most southern Protestants, he had no hang up about regarding himself as Irish. I expect to be writing further on this in the near future. I hope to be permitted to point out the misrepresentation (above) in the AG MAthews letter, if someone else does not point it out. I wish to refer to the ongoing controversy created by revisionist historian Peter Hart who made a number of derogatory statements in his 1998 publication, accusing Tom Barry of misconduct at the Kilmichael ambush in November, 1920. Hart's justification for such strong condemnation of Barry is based mainly on the following: Firstly, a British Army Report of the time, which has since been shown to be produced for propaganda purposes. The historian, Brian P Murphy, in his recent publication 'The Origins and Organisation of British propaganda in Ireland 1920' shows that Peter Hart, while rejecting Tom Barry's account of Kilmichael and accusing him of lies and evasions, relies on a British Report of December 2, 1920 which "was explicitly designed to spread lies and evasions by a process of verisimilitude." In other words, the British approach to spreading propaganda was designed to give the impression that the content was truthful. As Brian Murphy states, "Hart has failed to recognise the hand of Basil Clarke and his propaganda team at work." Secondly, Hart claims to have interviewed survivors of the Kilmichael Ambush as another source for his account of the event. At a recent historical presentation at University College Cork, I put it to Peter Hart that, given the dates that his alleged interviews with ambush survivors took place, it could not have been possible for him to conduct such interviews. Records show that, with one exception, none of the ambush participants were alive. He (Hart) again refused to name his interviewees. It is interesting to note that Meda Ryan, in her book 'Tom Barry, IRA Freedom Fighter', states that participants of the period were willing to discuss the Kilmichael ambush with her when she interviewed them in the 1970s and early 1980s. It is now obvious that Hart's account of the ambush at Kilmichael is not credible. He has dug a hole from which he will find it difficult to extricate himself. Anyone wishing to find out the true facts on Kilmichael can obtain proof in a book to be launched at the Munster Arms Hotel, Bandon, on Friday night, June 30. This publication gives fascinating details, supported by photographic identification, of those who participated in the ambush. It also gives insights into their background and lives.